Each week DragChamp recaps the biggest stories and best performances from the world of sportsman drag racing. Last weekend was headlined by the NHRA Carolina Nationals at zMAX Dragway and the Three-Tens at Huntsville Dragway. Ronnie Proctor wins Top Sportsman at zMAX, takes top spot in the national standings – Proctor entered the race in third place in the national standings trailing Doug Crumlich and JR Lobner. Racing in his last national that would count towards the championship, Proctor knew he needed to win the race to take over the points lead. In a clutch performance, worthy of a world champion, Proctor did just that when he defeated Jackie Robison in the final round. The win was his second this year and second overall. While Proctor is now in the lead, he can’t relax just yet as Crumlich and Lobner both have one LODRS points race left to improve their scores. Proctor also has one race left to extend his lead and I’m sure he try to do just that this weekend at Rockingham. Here’s a great photo of the Wally. Tyler Horner scores twice at Huntsville – Racing at the three-tens at Huntsville, Horner kicked the weekend off with a win in the Friday Gambler’s race. Horner then proceeded to win the $10K main event on Saturday night. Definitely a great weekend for team Horner. Anthony Fetch goes to back-to-back NHRA finals – After a runner-up finish in Stock Eliminator last month at the Dodge NHRA Nationals at Reading, Fetch followed that performance up with his second straight Stock Eliminator national event final round appearance at the NHRA Carolina Nationals over the weekend. Fetch was one win light away from making two finals at zMAX Dragway as he lasted until the semifinals in Super Comp. Fetch was a DragChamp pre-event pick to win Stock at both events in which he made the final. If you’re not familiar with the DragChamp pre-event picks, click here to see our Carolina Nationals sportsman preview article. Chris Garretson extends his Super Comp lead – Although he only made it to the third round at zMAX, Garretson padded his lead in the national standings by 10 points. Garretson was improving on a second round loss from earlier in the year so his third round finish was just enough to improve his score. As tight as the points race is this year, every point is important come November. Chris has one LODRS points race left to improve his score and he’ll be in Rockingham this weekend looking to add more points to his tally. A number of racers still have a legitimate shot at catching Garretson including Don Nichols, Mike Robilotto, Ray Miller 3, and Ray Miller Jr. I assume most of those racers will join Garretson in Rockingham this weekend to take their last shot at a championship. JR Lobner finally passes Crumlich for the points lead – For the third week in a row JR Lobner lined up for second round needing a win in order to pass points leader Crumlich and last week he finally did just that as he won his second round matchup and took over the national points lead. Although it took a lot of miles to get there and I’m sure he was under some pressure, taking over the points lead had to be a big relief for Lobner at the time. The only problem was Ronnie Proctor was also making rounds which put the pressure back on Lobner as he had to match Proctor in order to keep the lead. Unfortunately for Lobner a third round loss ended his day while Proctor went on to win the race making Lobner’s reign at the top of the standings a very short one. Lobner still performed well and will now have one last race to improve his score which will likely come at the Division 4 LODRS at Noble, Okla. next weekend. Johnny Ezell wins again – No surprise here but guess who won another big money bracket race. Ezell continues to collect big checks all over the country. This week he stopped by Huntsville Dragway for the three-tens race weekend and took home the $10K final on Sunday. Not a bad warm-up for the Million Dollar race this week where he is the defending main event champion. Devin Isenhower is one step closer to a Super Gas championship – Isenhower didn’t even compete last weekend but made the list after several of his competitors failed to improve at the NHRA Carolina Nationals effectively pushing him one step closer to the championship. While the points chase isn’t over his closest competitors wasted an opportunity over the weekend. Ray Sawyer, Jim Perry, Steve Hoyt, and Iggie Boicesco all fell early at zMAX which will leave most of them with only one opportunity to catch Isenhower. For most, that last opportunity will come this weekend at the Division 2 LODRS at Rockingham. Anthony Bertozzi wins back-to-back national events in two different classes – Bertozzi went wire-to-wire at the Carolina Nationals as he qualified number one with a 6.01 and then proceeded to run over the field collecting his 21st national event Wally. Bertozzi also won Super Stock at the Dodge NHRA Nationals last month in Reading which I believe was his last national event prior to Charlotte. Bertozzi was a Team DragChamp pick when he won Super Stock at Reading and we also selected him to win Super Stock at Charlotte. While he fell early in Super Stock at Charlotte, he picked up the Top Dragster win so I guess we weren’t far off in picking him to win, we just got the class wrong. AB also gave a heartfelt shout out to his buddy Kyle Seipel who’s been battling some health issues lately. See the video here. 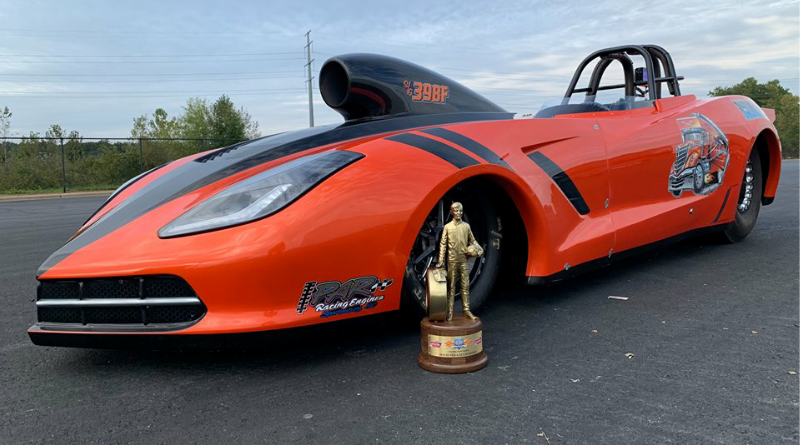 Joe Fisher of Racing RV’s wins Super Gas Wally – Fisher, the owner of Racing RV’s and the sponsor for Top Sportsman and Top Dragster, collected his second national event win at Charlotte in his beautiful Corvette roadster. Fisher made this week’s list for a few reasons, I like Super Gas for one, he has a badass car for two, and he’s a big sponsor of the sport for three. Congrats to the Fisher family for your win. It’s Million Week – The original and legendary Million Dollar Race comes to Montgomery Raceway Park this week. Although the big money bracket racing landscape has changed and there are $50k+ to win races seemingly every week, the Million is still on the top of the heap as it has the heritage of being the biggest race of the year for 20-plus years. Racers began lining up outside the facility on Monday which could mean another 600-plus entries for the $25K’s on Thurday, Friday, and Sunday with Saturday being reserved for the Million. The Million should see around 300 entries again this year generating a huge payout for one lucky racer. Visit DragChamp daily throughout the week as we’ll post results as they become available. And that’s the Top 10 in Sportsman Racing for the week. Don’t forget to visit DragChamp daily for the latest drag race results.